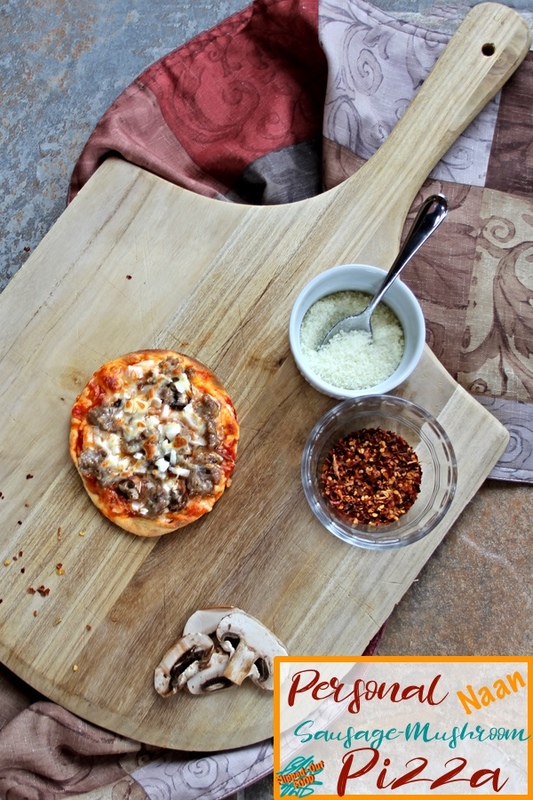 Personal Naan Sausage-Mushroom Pizzas make a perfect, kid-friendly meal for busy weeknights. The veggies and homemade sauce and can be prepared in advance, and the sausage cooks right on the pizza. All you have to do is assemble and bake! We used to have DIY pizza nights on an almost weekly basis. That was back when I’d actually make the dough myself—delicious, but what a pain! Predictably, I got a bit tired of it. But then, Phil came up with the idea of using naan bread for the crust as he was toasting some up to go with our curry one night. Suddenly, DIY pizza night was back in the rotation—even for weeknights! For the naan bread crust, we’ve tried doing a pre-toast on the naan bread and just baking as-is: we decided that the difference wasn’t enough to justify an extra step. The resulting crust is crispy on the bottom, with a nice chew in the middle that we quite like. I still make the pizza sauce myself because most jarred sauces are vile, IMO. It’s really easy to make, and you can do it a couple of days in advance. Win! See, it’s not necessary to cook the sausage in advance! 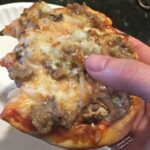 The only drawback with this method is that the sausage can let off some grease—but that’s easy to remove by mopping gently with a paper towel (I do that with takeout pizzas anyway!). Before we start our pizza assembly line, I set out all of the toppings in prep bowls (except for the sausage, which we pull directly from the package). We apply a couple of tablespoons of homemade pizza sauce to the bread, leaving 1/2″ around the edge, and then sprinkle on mozzarella some cheese. (Phil and I add minced onions to ours as well, but the kids abstain.) Then we dot on the sausage, add the mushrooms (or not) according to everyone’s taste, add a bit more cheese, and bake. It’s fun to get the kids involved in saucing the naan and adding their own toppings (except for the sausage: either Phil or myself acts as the dedicated “sausage depositor” to limit the number of dirty hands). I like to set out a shaker with red pepper flakes and one with Romano cheese (Parmesan is just fine). These pizzas are just about the perfect size for kids, but adults will need to either make two pizzas or eat a side salad to fill up, which is what Phil and I usually do. Although we eat ours in one hand-held piece, it’s fun to slice it up into slivers for the kids. And that’s it! With a bit of prep for the veggies and sauce (or use your favorite jarred sauce—I’ll look the other way), this is a quick, easy meal that feels out-of-the-ordinary and is fun for the kids. I hope your family gets a kick out of their personal sausage-mushroom pizzas! #CookBlogShare, a great food blogger recipe-share hosted this week by Lost In Food. #CookOnceEatTwice, a recipe linky hosted by Searching For Spice. 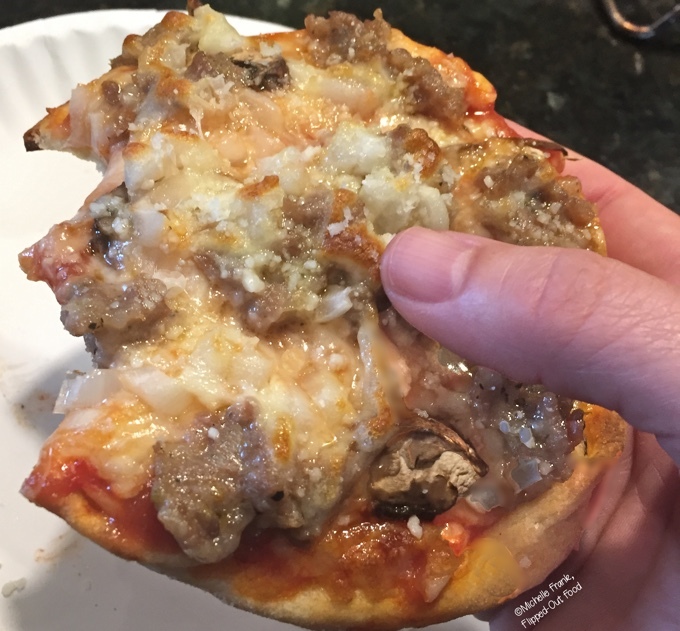 Personal Naan Sausage-Mushroom Pizzas are a perfect, kid-friendly meal for busy weeknights. The veggies and homemade sauce and can be prepared in advance, and the sausage cooks right on the pizza. All you have to do is assemble and bake! Set rack in the center of the oven (see Recipe Note #3). Preheat oven to 425º. For each piece of naan bread, apply 2–3 tbsp of sauce (depending on the size of your naan bread and how saucy you like your pizza), leaving about 1/2" all around the edge. Sprinkle on about 3 tbsp. mozzarella cheese. Scatter sausage pieces over the cheese (see Recipe Note #4). Add ~2 tbsp of mushroom pieces. Sprinkle with 1–2 tbsp of additional mozzarella. Bake pizzas for 10 minutes, or until the sausage has cooked through (see Recipe Note #5) and the cheese is golden and bubbly. Remove the pizzas to a cooling rack. Use a paper towel to gently mop any grease from the surface of the pizza. Let pizzas cool for 5 minutes. Serve with pepper flakes, grated Romano or Parmesan cheese, and a shaker of Italian spices (if you'd like). 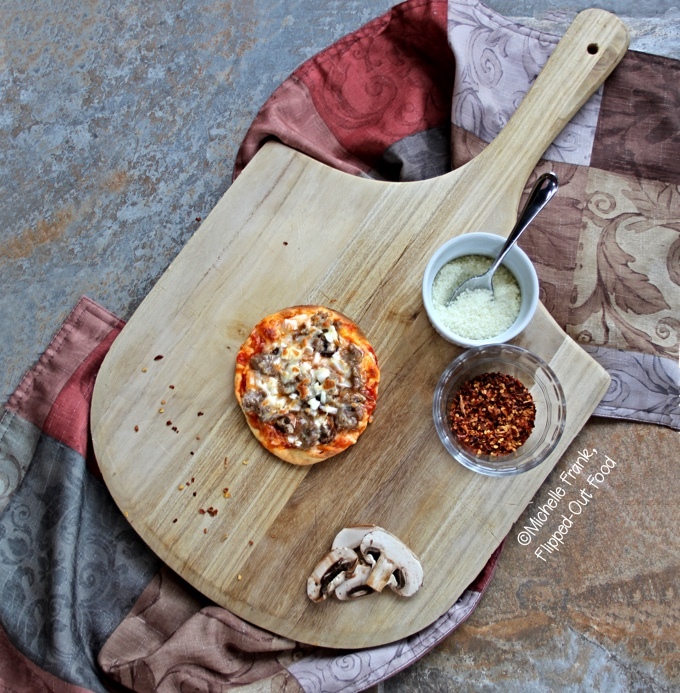 Recipe for Easy Homemade Pizza Sauce (click link; or use your favorite jarred variety). Cremini mushrooms are also known as baby portobello mushrooms. If you can't find them, button mushrooms will also be just fine. I often put an empty baking sheet of a sheet of foil on the lower rack to catch any drips from the pizzas. Slice into a couple of sausage pieces to ensure that they are completely cooked and there's no pink remaining. Oooh yummy! These sound delicious! It’s a great idea to use a naan as a pizza base. I often make pitta pizzas if I don’t want to make the dough myself although I do sometimes make the dough in the breadmaker which makes it a bit easier too. Thanks so much for sharing with #CookOnceEatTwice! Thanks, Corina! I think that homemade dough is best, but who has the time! I still make the dough myself if it’s for a weekend meal, but this is now a go-to family favorite!